This cookie has a very traditional shortbread cookie texture, yet it is light as a feather, sweet and literally melts in your mouth!!! 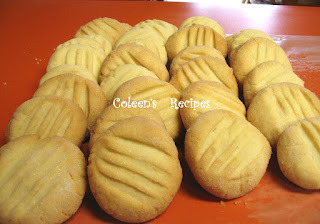 These cookies are one of my families favorites and they are gone in a snap!! Beat the room temperature butter for about a minute, or until it is smooth. Add the powdered sugar, salt and extracts and beat on medium high for another minute. Add the cornstarch and beat until well mixed. Add the flour, one cup at a time, beating well in between each cup. Beat everything for one more minute, then cover and chill for about 30 minutes (I seldom chill the dough and it does ok). Roll the dough into 1" balls and then roll the balls in granulated sugar. Use a fork to gently press down on the cookie ball (see photo). Bake on ungreased baking sheet for 10-12 minutes at 350°. You will know when they are done because they get lightly golden around the edges. Cool on the cookie sheet for about 30 seconds before removing them. These are excellent frosted AND unfrosted. Makes 36 cookies. NOTE: If you don't have coconut extract, you can just use 1 1/2 teaspoons of vanilla, however, the coconut extract truly adds a wonderful taste. The finished cookie does NOT taste like coconut, but it adds a wonderful yummy-ness to it, so I hope you will try it.